The Parc Montsouris in Paris is close to where I live, and very kid friendly. It’s not popular enough to be full of tourists like Luxembourg Parc (it’s hardly as spectacular either) but I like the place, my son gets to run around on his scooter, there are plenty of other kids and a couple of activities for them. After the Christmas celebrations were done, we had to go for a walk (burn some calories) and try the toys. Walking in the park was quite fun, seeing all the happy kids with their new toys that needed testing, my son being one of them. The sunset was looking quite amazing, I tried to capture it as well as I could but it doesn’t feel as spectacular as it felt at the time. Maybe that’s because it was great to have some blue sky in the middle of winter. I captured the image in HDR settings, meaning three shots at three different exposures. I processed two of the pictures by importing them in Photoshop and masking in the lighter tones manually. I find it is a more natural way of “HDRing” the image, and as I rarely take the tripod with me it becomes a necessity. The birds are actually a single bird, that got captured on two images which I copied in because it gives the image a bit of dynamism. If there is one thing that’s great about winter is that the sunsets are earlier, thus easier to capture, not requiring having to go out late in the evening. 08 Jan	This entry was published on January 8, 2014 at 10:44 pm. 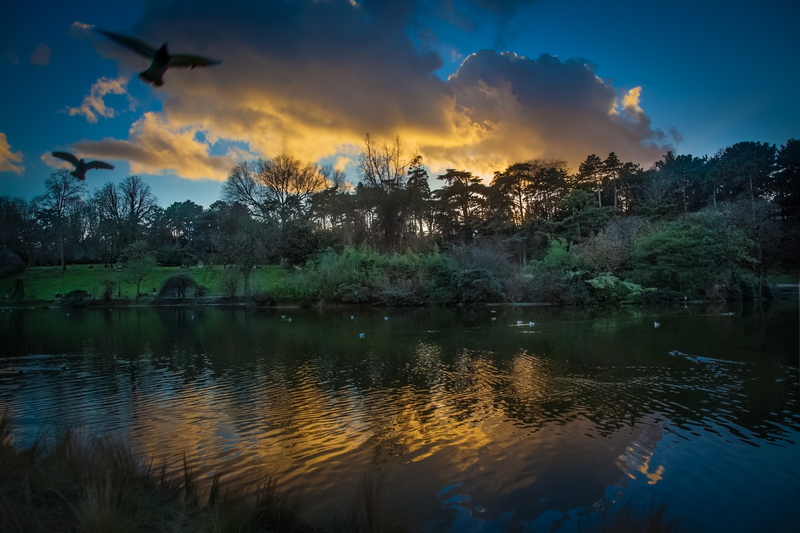 It’s filed under Animal, Canon 5D Mark II, HDR, Landscape, Parc, Paris, photography, winter and tagged bird, lake, montsouris, Parc, Paris, photography, Sunset. Bookmark the permalink. Follow any comments here with the RSS feed for this post. That’s interesting, that you did the HDR processing in Photoshop. You mention processing two of the exposures. What about the third? Beautiful effect with a landscape. It’s a nice change from the ubiquitous over-the-top HDR cityscapes.